Fall is my favorite time of year. Road trips can be especially fun as you see all the dazzling leaves putting on their full colorful display during your travels. 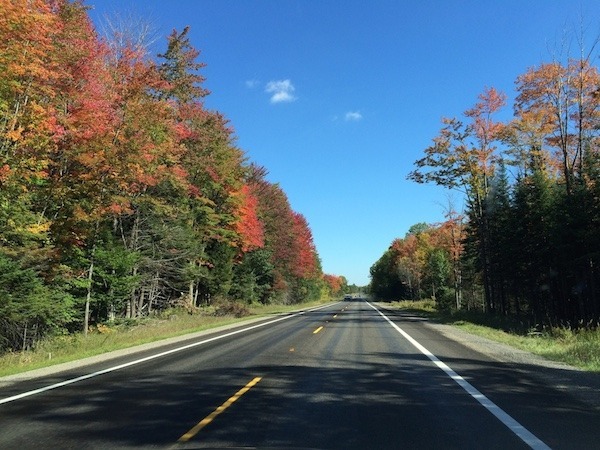 This fall we decided to take a trip up to Traverse City, Michigan. We were recently the guests of the Grand Traverse Resort and Spa. We were not financially compensated for our visit or a review. All opinions are our own and based on our experiences. Those of us who follow the foodie scene know that Traverse City has become one of the midwest’s top culinary tourism destinations. Chef Mario Batalli has a summer home in the area and talks about all charm of the area and his favorite local restaurants on social media quite often. We made the trip from Chicago to Traverse City in a little more than 4 hours with one stop. Your timing will depend on how long and how many times you choose to stop along the way. We left early in the morning and went to brunch at Anna’s House in Grand Rapids. They’re open 6am to 2pm daily. Anna’s has two locations. We stopped at the newer location on Beltline Road and it was an easy off and on the highway for our trip. The breakfast was big and good. 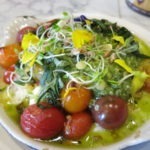 Anna’s focuses on fresh local and seasonal ingredients. Happily, fall pumpkin pancakes and hot apple cider were on the menu during our visit. Anna’s is clearly a local favorite as there was a line outside the Sunday morning we arrived, but it moved quickly and we only waited about 15 minutes. 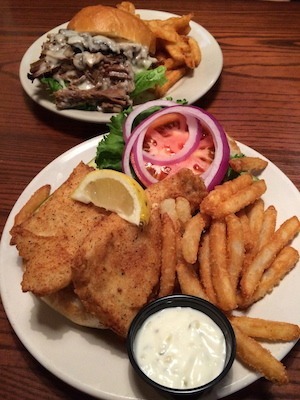 Portions are generous so if you’re not super hungry go ahead and split something – you’ll be just fine. 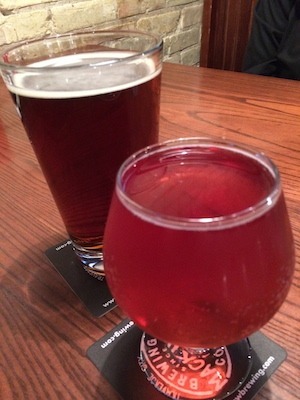 When we arrived in Traverse City we were quite thirsty so our first stop was the Right Brain Brewery. 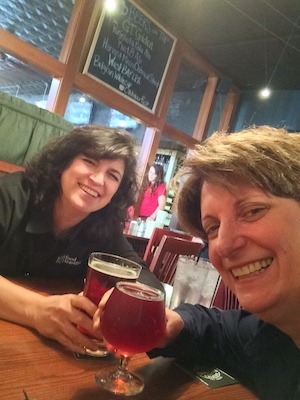 They made us feel right at home as we settled in with our beer sampler. 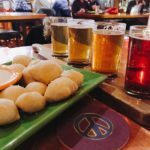 You have to know that Michigan is loaded with many terrific micro-breweries and Traverse City has an embarrassingly large amount of excellent choices. But we have a special fondness for the head brewer here and would recommend you pay them a visit if you’re in the area. Their creative menu of waffles and snacks intrigued us as well. As for the brew, well we really enjoyed all the beer we tasted, but had a special fondness for the Northern Hawk Owl, a medium bodied amber ale and the Chubby Squirrel their seasonal spiced amber ale. Lucky for us we were even able to purchase some of the Northern Hawk Owl to take back home, which we did! We then made our way to the Grand Traverse Resort & Spa. The resort really is like a city unto itself. Located on 900 acres of rolling hillside the beautiful scenery makes for a relaxing stay. The main lobby leads to a promenade of boutique retail shops including Dylan’s Candy Bar & Candy Cafe featuring Moomer’s Ice Cream – a local treat that’s a highlight in itself – American Spoon for locally sourced jams, fruit butter and preserves, and several retail clothing, logo and pro shops. It’s one-stop shopping if you don’t want to make the trek into town. Besides shopping, the Grand Traverse has many amenities that include three golf courses, indoor and outdoor tennis, indoor and outdoor swimming pools, beach access, a great spa, excellent dining and more. The resort is perfect for a girls’ weekend, golf getaways, weddings and meetings, and a wonderful retreat for any time of year. 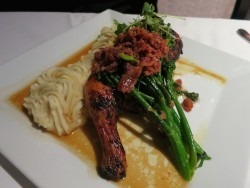 We had the chance to dine at the Aerie Restaurant, located on the 16th floor of the tower building. We had a perfect window view of the setting sun on Traverse Bay as we sipped our cocktails and unwound from the day on the road. Our server, Jen made sure we had everything we needed for a perfect relaxed dining experience. We started with a smoked trout salad crostini that featured smoked trout, red onion, celery, capers, rice vinegar, fresh lemon juice, black pepper, first press olive and pesto oil atop crunchy crostini. We simply loved this starter. 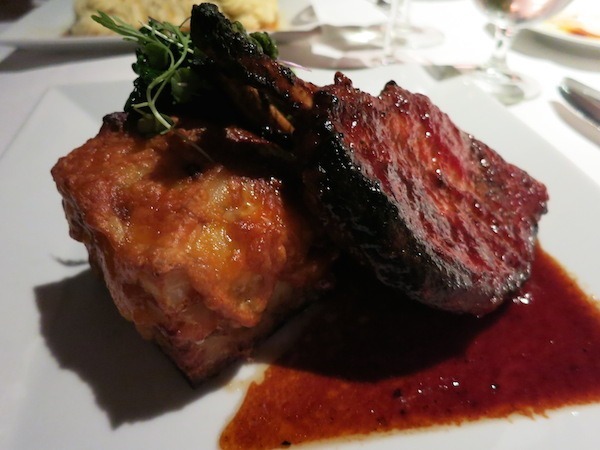 Another favorite was the marinated two-bone pork chop smothered in house made BBQ sauce. The smoked cheddar redskin potato tower – yes, a cheesy-potato tower – made a perfect pairing. 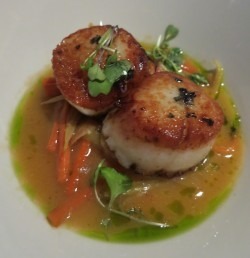 We also sampled the pan-seared scallops and honey-herb glazed chicken with celeriac mashed potatoes. Everything was quite well-prepared and delicious. The Aerie also has an extensive dessert and dessert wine menu sure to please every palate. We tried the chocolate bananas foster, which was a deconstructed bananas foster, and the cherry toffee pudding featuring Michigan’s finest cherries. After a good nights sleep we headed off to the spa for a little pampering with an hour-long massage, just what the doctor ordered. The spa has all the services you would want from massage and hydrotherapy to nail and hair care services. We headed into town next and as we suspected Traverse City had well more available than the two days’ worth of eating and exploring that we had planned. The “downtown” strip is loaded with cute shops, restaurants and bars that can make the adventure fun and leisurely. From white fish sandwiches to Italian cuisine, Mediterranean eateries and everything in between, this place truly is a foodie’s heaven. The townspeople are super friendly and easily recommend more places for you to explore. They do seem to support one other and their foodie culture generously, and that’s great for visitors like us too. 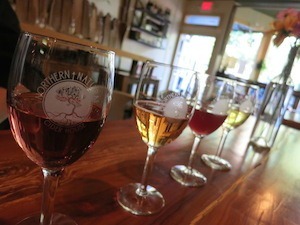 Tasting the local wine, cider and spirits of Traverse City is a trip all by itself. 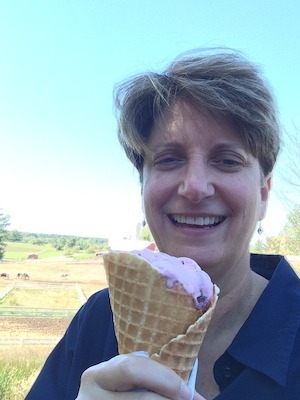 The nearby Leelanau Peninsula has many wineries and a local dairy to taste test. 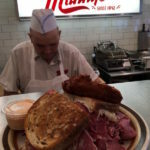 What caps off any foodie destination? A sweet ending, of course. We had to experience the famous MOOmers Ice Cream voted “America’s Best Scoop” on Good Morning America. Moomers Homemade Ice Cream makes over 120 flavors and has over 20 unique flavors available daily. I chose the Cherries Moobilee that has black cherry flavored ice cream with chunks of black sweet cherries, chocolate fudge swirl, and chunks of brownies. It was ice cream perfection! As I sat there enjoying my homemade cone and ice cream somehow knowing that the Plummer family (proprietors of Moomers) use cream from their own Moomers Farm Creamery and dairy farm right behind me made it all taste that much better. All and all, Traverse City was a wonderful local fall trip. 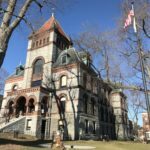 The only downside was that we wish we had more time to experience more of the food, wine and spirits the area has to offer. I’m guessing another trip to Traverse City will be in our future sooner than later. Grand Traverse Resort & Spa This amenity-filled resort has everything you could want. Ask for a high floor room for a spectacular view. Mackinaw Brewery Company Very good local beer and eats. Terrific service and ambiance. Moomers Ice Cream A must stop that’s a little out of town but well worth it for delicious homemade ice cream. Poppycock’s Restaurant Terrific new American cuisine that has a great vibe and features martinis & jazz on Friday’s. We also loved the artwork in the restaurant. Northern Natural Cider House Organic hard cider spot. This is a great place to rest your feet in downtown Traverse City and relax with some yummy cider. 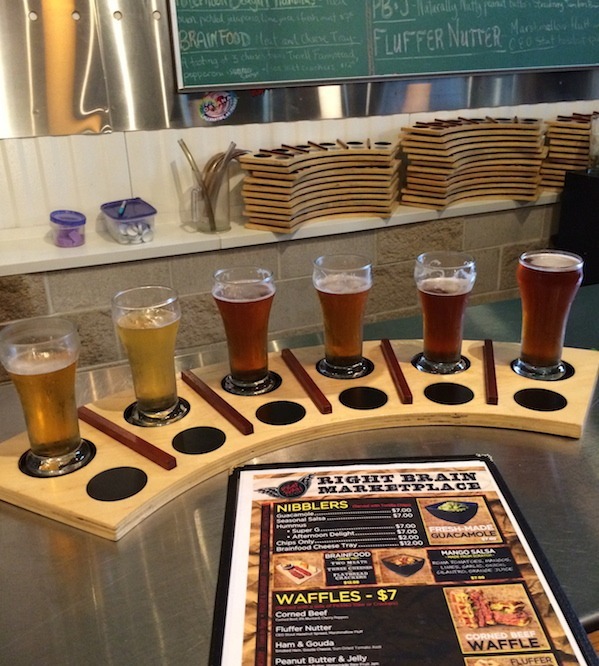 Right Brain Brewery Go taste what head brewer, Nick Panchame is brewing up at this Traverse City treasure, you won’t be disappointed. Chat up the locals on what they’re drinking. 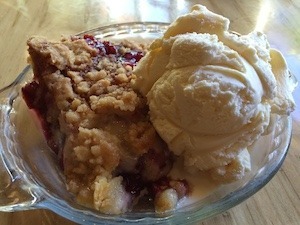 Grand Traverse Pie Company Get a slice of one of their cherry pies. You’ll dream about it for days. We also love the doing good and giving back karma of their second “community” store that gives profits to community good. Grand Traverse Distillery We loved their cherry-flavored vodka. Stop in for a tasting. The Village Grand Traverse Commons A former asylum turned into a shopping, winery and restaurant space. They’ve maintained the historic buildings and created a unique environment for tourists and locals to shop. Traverse City is a year-round destination. Summer includes water sports, hiking and farmers markets. Fall has beautiful scenery and harvest time. Winter has snow sports like snow shoeing, snow mobiles and spas. Year round you get the great tastes of Traverse City. Whenever you visit be sure to check the dates and times that all businesses are open. This is a seasonal tourist city. Most shops are open year round but check ahead to avoid disappointment. 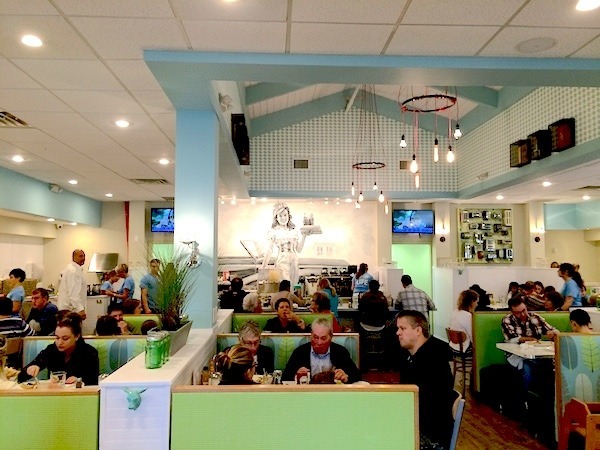 THE QUICK BITE: Traverse City is a foodie paradise and so much more. If you’re looking for a quick weekend trip in the midwest this is a place you will enjoy for its great variety of food, beer, wine and fun. Sounds like a fabulous trip! Traverse City is back on my radar. Thanks for sharing! 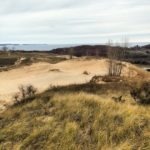 Great article that really captures the spirit of Traverse City–a town near and dear to me! Looks like a great place to eat, drink and be merry! Wow, I’ve never visited Michigan but it looks like that’ll have to change in the future upon returning to the US. 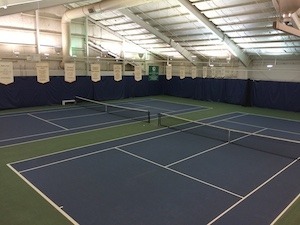 You had me at the Beer Sampler and the nice looking tennis courts. Just as long as it’s not too cold, count me in! This is an inspiring guide to a quick visit to Traverse City. I hope to get there soon. It has been 20 years since I have been to Traverse City. Your article and photos brought back so many great memories!! I know nothing about the American (or Canadian) foodie scene. This looks like a lovely spot for a getaway, and the fall colors are an added bonus. It looks like you had an incredible time in Traverse City. 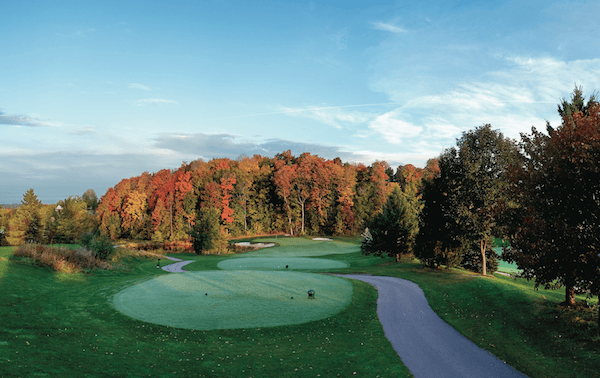 I love the photo of the Wolverine Course at Grand Traverse Resort & Spa. The food looks incredible and you saw some awesome foliage! 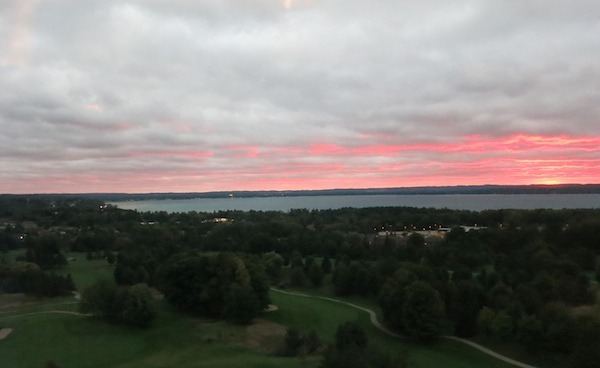 The Grand Traverse Resort looks perfect for a weekend getaway. Oh that food looks delicious. I see you really enjoyed your visit! I would never have known Traverse City was that well known to foodies. Thanks for the info! That pork chop looks sinfully delicious! Made me miss the beautiful fall in the Michigan of my youth. Anytime I read about food I am happy 😀 I still have yet to get to Traverse City, but when I do, I will make sure to check out some of your suggestions! Wow! Your pictures of the fall foliage made me (unexpectedly) a little homesick! Gorgeous! And what a bounty of delicious food dishes and beverages. 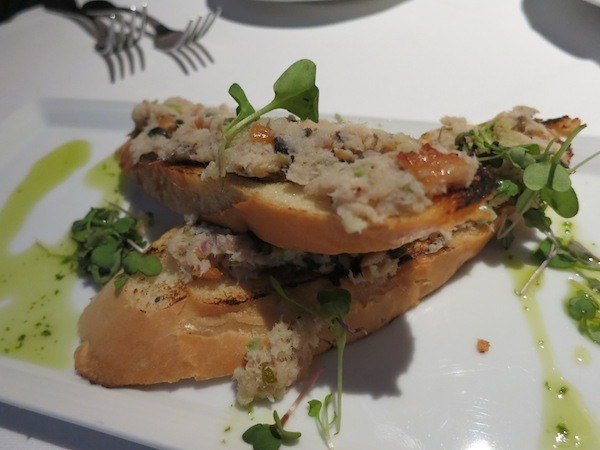 I’d love to try the smoked trout salad crostini that you described and, of course, Moomers! Moomers and Traverse City is definitely worth the trip! As a Michigan girl, I have a great love for this area and have vacationed there over the years since I was a child. I’m very fortunate to still have relatives in Suttons Bay on the Leelanau Peninsula, and have written from time to time about how lovely the area is. Did you get to Sleeping Bear Dunes at all? One of the two National Lakeshores in Michigan. If you go back, you may want to consider visiting the Anishinaabe (Ojibwa) Museum up in Peshawbestown on the M-22 circuit north of Suttons Bay. Continue past Omena to Northport on the tip of the peninsula; there is a roadhouse there dating back to the 1920’s that my parents remember from their salad days. Then you can come back around on the west side to charming little Leland and down to Sleeping Bear. Truly a magical part of the world. Cherry Festival is fun, too! Thanks for all the tips Betsy! We unfortunately didn’t get to Sleeping Bear Dunes on this trip but it’s definitely on our radar. I’ve wanted to get up there for years. 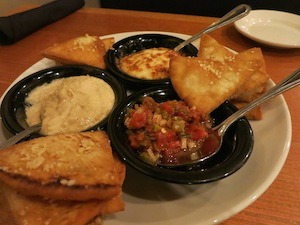 That roadhouse in Northport sounds like a must for us Food Travelists. We did the circle tour around Lake Michigan about 7 years ago and was taken by how beautiful the terrain is up there. We look forward to another trip to the Mitten state very soon. I have been reading a lot more about Traverse City and the city and area is now on my wish list. Looks like there is plenty of food variety to keep everyone happy.